Book with us now and your guide will be professional, friendly, and highly knowledgeable. You’ll never feel out of place, uncomfortable, or underqualified on a trip with Grand Teton Fly Fishing. Our staff has about 200 years of combined guiding experience, and some have guided in Jackson Hole for more than 20 years! Every guide takes trips regularly to ensure up-to-date knowledge of fishing hot spots, expert oarsmanship to get you down the river safely, and a high level of angling prowess to pass on to you, even if you’re a seasoned fisherman. Bruce has been a major part of the transition from the Jack Dennis years to what we are today. He has over 40 years experience in the valley and guiding industry and still shows incredible patience and love for what he does each day… Talking fishing with our valued customers! When not here in Jackson Hole managing the GTFF staff or walking the creeks and rivers of GTNP you will find Bruce in Florida or Texas spending his off season with family and harassing the local fish all winter. Specialty: Guiding you to hunt with a fly rod using all your senses. 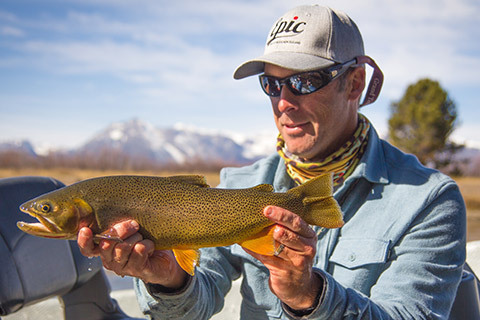 Scott Smith has been a Jackson Hole fishing guide since 1999 and considers the Snake River in Grand Teton National Park a national fly fishing treasure that every avid angler should experience. Scott was the Wyoming Top Point guide in the 2017 One Fly Event. He enjoys instructing/guiding anglers of all skill levels and has a depth of knowledge and insight that comes naturally and is easy to grasp. His style combines the science of fly fishing, the art of the craft, and hunting. Scott became the managing owner of Grand Teton Fly Fishing (formerly Jack Dennis Fishing Trips) in 2012. His other passions are fly fishing photography, travel, skiing, mountain biking, and family time. Trey is an iconic member of our staff who only guides a few days each year but will always remain an ambassador and friend to our staff. Trey is owner/manager of Flat Creek Ranch in Jackson Hole. He is an avid angler, hunter, skier, world traveler and family guy who is infectious to be around. I started fly fishing as a schoolboy in England back in the mid to late 1960s – and it changed my life! Later, I went to Middlebury College in Vermont where I received a degree in English literature before finally launching my career as a guide. I’ve worked in Alaska, throughout the state of Montana, on the South Fork of the Snake in Idaho, on Little Cayman in the British West Indies and here in Wyoming on our fabulous Snake River. In the off-season I organize and lead trout trips to New Zealand, Argentine Patagonia and the historic chalk streams of England’s southern counties. In addition, I’ve had a parallel career as an editorial and commercial photographer with an emphasis on travel and fly fishing. I’m thankful every day for this half-century love affair with a fly rod and a set of oars…and so far there’s no end in sight! Specialty: Keeping you on the fish! Ed has been with our staff since the early 2000 at JD. He has a mellow style that can be relaxing and while doing so he has a sneaky way of keeping you on the fish. Ed was Top Point Wyoming guide in the 2014 One Fly Event. When not guiding or fishing on his own he loves being a dad to his young son, Rowan(7). In the winter he enjoys ice fishing and gets to the saltwater as often as possible. I first came to Jackson in the summer of 2003. I quickly fell in love with the place and have been here ever since. I love nothing more than floating down beautiful rivers chasing trout. Please check out my blog at www.jhtrout.com for more information on me , the areas we guide, and the fishing conditions. Neil has been a great asset to our guide staff for the past 10 years but is transitioning to a new career in nursing. We hope to keep Neil as part time guide through the peak summer months so he can continue his passion for the river and fly fishing. Specialty: An adventurous nature and an infectious love for fly fishing. Whether it’s fly fishing the wild and remote saltwater flats of Sudan, backpacking through the lush New Zealand wilderness in search of trophy brown trout, or walking the famous tributaries of the Snake River closer to home, Josh has an adventure waiting for you. Over the past 10 years, Josh has traveled the globe to pursue his passion for fly fishing. In 2017 alone, Josh fished in Louisiana, Florida, Panama, Turks and Caicos, Mexico, Bahamas, Hawaii, Georgia, and Arizona. As well as guiding 100 + days on his beloved rivers around Jackson Hole. 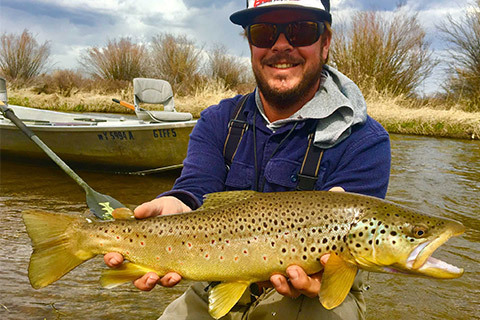 Whether you’re new to the sport or even a seasoned fly fisher, Josh’s wealth of knowledge and infectious love for the sport are his greatest attributes and go unmatched. In 2015 Josh was the top guide for both Idaho and Wyoming guides in the Jackson Hole One Fly competition. Josh is also a well-published photographer and his photos and stories regularly end up in articles in top fly fishing publications. During the winter months Josh hosts anglers to the world’s most exciting fly fishing destinations. In the coming years, Josh has trips booked to French Polynesia, Tanzania, Bahamas, St. Brandon’s, New Zealand, and South America. You can follow Josh’s musings on his blog – www.joshgallivan.com. Chris started guiding fly fishing trips in Jackson Hole in 2001. For four years before that, he worked for the US Fish and Wildlife Service as a river ranger on the Good News River in Alaska. Chris loves the rivers, especially spending time on the Salt River with his family. When fly fishing season is over, you might find Chris guiding winter snowmobiling trips. Specialty: Picks the right fly every time! Ben has been with our staff since the early 2000. His style is laid back but with an infectious hunting instinct. He is an incredible tier and most of his guests get a chance to try his personal favorites if they swear to secrecy. Ben is also an avid wet fly guide quick to hone your skills subsurface if needed. In the winters he enjoys snowboarding and traveling with his wife(Karen) and two sons(Lincoln and Ennis). Sammy has been in Jackson Hole since the late 70’s and is still as down to earth as ever. His local knowledge is hard to top and he has quite literally seen it all and has the stories to prove it. These days Sammy enjoys instructing and guiding folks in GTNP. In the winter he has been a longtime member of the JHMR ski instructor staff. Specialty: Deep knowledge of the area and a fun guide to spend the day with. Johnny has been with our staff since 2007 after guiding scenic trips in the Park. His love for fly fishing and a deep connection to the local rivers drew him to guide trips on a new level. His stories and local knowledge make him a very well rounded guide for any visiting angler. Specialty: A year round professional guide, wine maker and world traveler. Alex came to our staff in 2014 after finishing a few years on the Middle Fork of the Salmon. He was a quick learner of the local fisheries and his passion to be on the water was a great match for our staff. We typically use Alex in the peak season when his schedule is free from tending to his grapes back in Boise, ID. In the winter he has been an integral member of the Jackson Hole Mountain Resort ski instructors/mtn. guides. He has spent many years in Argentina where he met his wife, Tete. Specialty: Easy to get along with and passionate about the rivers. I was born in Connecticut on Long Island sound. I spent my teen years growing up in Vermont where my love for fly fishing began to grow. After working as a psychiatric counselor for 5 years I decided to move to the Jackson Hole area and pursue a guide carrier. I have been guiding the rivers and lakes surrounding the valley for 9 years. In my off season I work as an AASI certified snowboard instructor at the Jackson Hole Mountain resort. When im not fishing or snowboarding I enjoy backpacking, biking, whitewater, and music. I feel blessed to call Jackson my home and even more blessed to guide the surrounding waters. There is no feeling like floating beneath the Grand Tetons fishing for native cutthroat trout with dry flies. Specialty: A true local with an instinct to find Snake River trout. Pat is a Jackson native who has been guiding our visiting anglers for nearly 15 years! He has a simple style that produces and is eager to teach our guests the way to chunky trout in the net. When not guiding he spends his free time being a dad with a little Wyoming hunting and fishing mixed in. Specialty: A passion to hunt big fish even if it means catching nothing. Brian is another true local on our staff that has seen many crazy things in the realm of fishing over his life. He splits his summers between Montana, where his family resides and here in Jackson where he loves guiding the Snake and all the surrounding drainages. Hook up with Brian before mid September because then he becomes a hunting mad man, lost in the hills of Montana. Specialty: Enjoys turning guests onto the sport of fly fishing in one of the country’s most beautiful places. Walt has guided in Yellowstone National Park and Jackson Hole, on the Green River, in the Pinedale area, and on the Idaho side of the Tetons on the South fork of the Snake River for 15 years. Walt has been an avid participant the last 10 years in the Jackson Hole One Fly competition. He has also worked with the Wounded Warriors and Casting for the Cure projects. Walt’s calm demeanor and attention to detail make him a natural fly fishing teacher. In the winter he doubles as a part-time ski instructor at Jackson Hole Mountain Resort and works as a full-time ski patroller at Snow King Resort. He is a certified EMT and wilderness responder. Mark is another iconic member of our staff who is our PNW Ambassador and a GTFF owner. Mark and his wife(Rachel) live in Portland, OR where he works for Korkers Footwear, a specialty boot manufacturer that is well regarded in the fly fishing industry. They love to travel and spend time outdoors with their two daughters(Charlotte and Hannah). If you hear the Grateful Dead playing while fishing the Deschutes, Metolius or John Day, look around, you may see our friend Mark! Josh, new to our staff this year has been guiding the area for over 10 years. He grew up in Jackson Hole therefore knows the local waters very well and has the patience to teach any guest the ways of the Snake River. He enjoys saltwater fly fishing and skiing in the winter and also has dabbled in home building/carpentry. Luke has been in Jackson for 4 years now and has done a fine job at making his way into the Mountain culture of JH. He works full time with our guide and friend Trey Scharp at Flat Creek Ranch tending to ranch duties while also getting some guiding in on their incredible alpine property. He will be working for us part time on the Snake River this year and so far his attitude speaks volumes. You will find Luke at the Jackson Hole Mountain Resort in the winter as a ski instructor.